Hey Vivacious Viewers!! This week I wanted to tell you about the best burger I’ve ever had…the Southern Burger from D-Luxe Burger in Disney Springs! This is the second article in a series of Disney Springs Dining favorites of mine so be sure to subscribe below to get these and many more restaurants and shop reviews from Disney Springs! This post contains affiliate links, which means I receive a small commission if you make a purchase using these links. It is at no additional cost to you and is basically how I keep the Disney magic going on Vivacious Views! The Southern Burger features a signature blend beef patty with a Fried Green Tomato, Pimento Cheese, Lettuce, Grilled Onion, and Bacon. for $12.99. That’s how I felt about this burger!! I had dreams about it and when I finally had it again our Memorial Day trip it was incredible. Oh, my just look at that!!! I ordered the Southern Burger Medium Rare because, well, that’s the only way to order a burger!! We also added the Regular French Fries ($4.99 for Regular and $7.49 for Large) and picked up one of each of the dipping sauces to try. Note: Fries and Drink are not included with the burger. After ordering at the counter you will receive a pager to place on the table for your food to be delivered to you. You can pick up drinks, sauces, and condiments along the wall…and get as many sauces as you want for dipping your fries. They tell you to! I’m not a fan of horseradish and I didn’t really like the Curry Ketchup either, but the other 4 sauces were delicious! The Garlic Ranch was my favorite. There are several other burger options including a very popular El Diablo Burger which is a chorizo and signature blend beef patty, fried banana peppers, pepper jack cheese, lettuce, tomato, grilled onion and chipotle mayo for $11.99. I will be trying this in the near future!! A Classic Cheeseburger, A BBQ Burger, A Veggie Burger, and a Buffalo Chicken Sandwich. D-Luxe Burger offers a Duo Meal Options where you can Make-Your-Own Combo Meal as well. The Classic Duo is (2) Classic Cheeseburgers, (1) regular order of Fresh-cut Fries and (2) Fountain Beverages for $24.99. The Premium Duo is (1) Classic Cheeseburger and your choice of (1) Premium Burger: El Diablo, Vegetable, Barbecue, Southern or Seasonal Burger. Also includes (1) regular order of Fresh-cut Fries and (2) Fountain Beverages for $26.99. The Ultimate Duo is your choice of (2) Premium Burgers: El Diablo, Vegetable, Barbecue, Southern or Seasonal Burger, and (1) regular order of Fresh-cut Fries with (2) Fountain Beverages for $28.99. A selection of Artisanal Shakes and Floats are available for $7.50 each. There are several more on the menu and all consist of Vanilla Gelato being blended or mixed with something delicious to make a tasty treat. For example, the Salted Caramel Gelato Shake is vanilla gelato blended with milk, caramel syrup, and Hawaiian black sea salt, topped with whipped cream, caramel drizzle, and Hawaiian black sea salt! There is also a crazy selection of Alcoholic Beverages for the peoples who are adulting at Disney, and a Kids Menu for the little ones! I really liked the at-home-ranch-style design to D-Luxe! Pictures lined the walls with cool info about Flordia Ranchers. be sure to ask your waiter! The burgers I will continue to dream about until my Disney World return in October!! 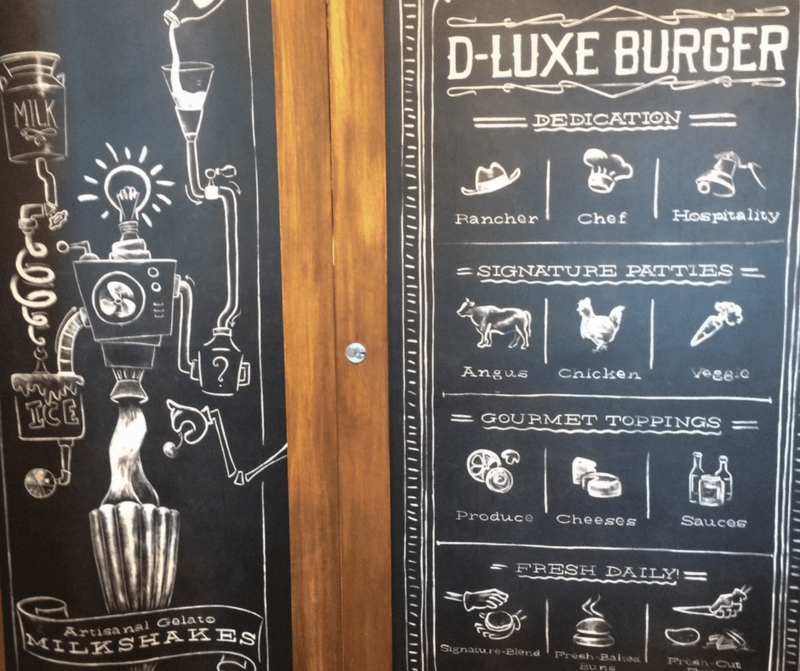 D-Luxe Burger also offers a Mobile Order Secret Menu which includes a Bacon and Blue Burger, Chicken Nuggets, BLT Sandwich, Onion Rings, Grilled Cheese Sandwich, and a Strawberry Shortcake Gelato Shake. For Full Details on the Secret Menu Click Here. Have you had one of the amazing burgers at D-Luxe?? Let us know what you thought in the comments!! Did you love it as much as I did or have you had a better burger at Disney World??? Let me know…I love trying new things! !